Since it was first built in 1977, the IBAU CENTRAL CONE SILO has been constantly developed, which has led to today’s huge multicompartment silos. They are a major part of a production plant for a variety of building materials. The production of special materials requires mixers, bin weighing stations, as well as finished-product transport equipment, all placed underneath the cone. 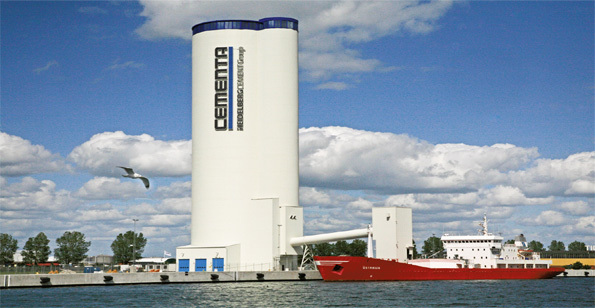 EXAMPLE MALMÖ/SWEDEN: The worlds largest multicompartment silo, with a capacity of 30.000 t, diameter 26 m, height 90 m, built for Cementa AB HeidelbergCement Group, start-up in March 2012, after 18 months of construction, without any delay or accident. 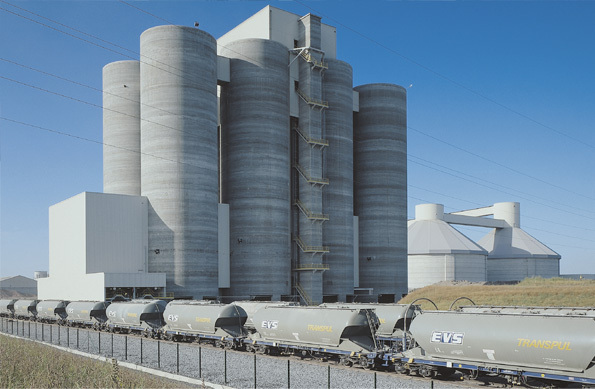 8 IBAU Silos with dispatch facilities for road and rail tankers, for the works in Gaurain-Ramecroix of C.C.B., Belgium.